This is visual dexterity - cubed! Q•bitz will challenge your visual agility! Players puzzle over how to recreate the patterns on the game cards using their set of cubes. Three fast-paced rounds of play require different skills each time… quick thinking, lucky breaks, or memory muscle power. Each round is a race. The first player to correctly match the pattern claims the round and the card. Collect the most cards and you win! 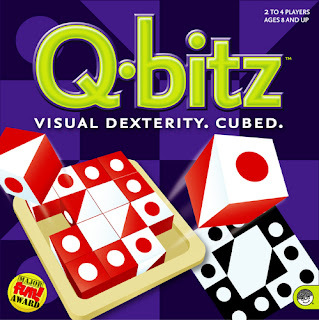 In Round 1, players race to manipulate their cubes to create the pattern on the Q•bitz card. The first player to complete the pattern claims this card as victory. Round 2 adds luck to the equation as players roll their cubes and use as many as possible to recreate the pattern on the newly revealed Q•bitz card. Re-roll your unused cubes as many times as it takes to complete the pattern. Be the first player to complete the pattern and claim the card as victory. Round 3 really tests brain power, as players have to recreate the pattern from memory. Players have 10 seconds to study the newly revealed Q•bitz card. Then the race is on to see who can recreate the pattern from memory. The player with either the correct pattern or the most cubes in the correct place wins the card.